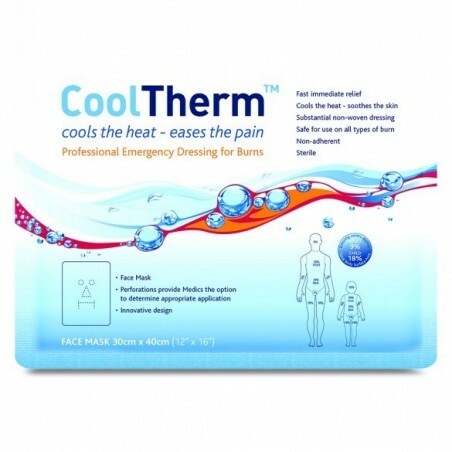 The CoolTherm Facemask/Large dressing is uniquely dual-purpose. The eye/nose/mouth apertures are perforated and can be easily removed. This allows quick preparation of the dressing for use on a face. 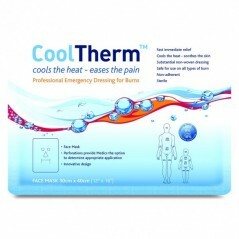 Alternatively, leaving the perforated areas in place renders the dressing suitable for covering larger areas such as a limb or the torso. This dual-purpose design offers additional flexibility, particularly valuable in the space limited environment of an emergency ambulance.